Once considered part of lower Manhattan, this famous New York City Borough became famous during the 1960's when the residents wanted to disassociate their area from the slums in the lower East side. From this came the high brow name now used to refer to this part of New York--the East Village. In the 1800's it was part of the Dutch Governor's family for seven generations. Once it was sold off to investors through the years, it became home to incoming immigrants from around the world. In the 1960s it was part of the hippie, political dissident, and beatnik movements. Now East Village is home to students and young professionals. New York University and Cooper Union Art School are part of the landscape here. 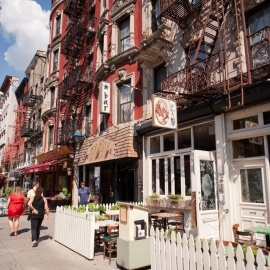 This very Bohemian area is home to different neighborhoods such as Alphabet City, Losaida, St. Mark's Place, and The Bowery. Each one has fallen into and out of fashion throughout history. Today, it is very fashionable to be part of the East Village scene--a place to see and be seen. In Alphabet City, there are housing projects with thousands but the fashionable scene is moving its way towards the river. Soon, there will be high rise condominiums with views of the river that sell for millions. And this area will regain its fashionable address once again. Their crust is fantastic! Altogether it is a very good pizza with friendly staff. They have fantastic wings! I love pairing their wings with their onion rings. I never miss a show at this great comedy spot. If you love improv this is a must do in NYC. And the ticket price is a great value. My friends and I love to visit every time we are in NYC! Pros: Fun up and coming comedians, great improv, affordable tickets.